Yes, these are things that are happening in this chapter. How did we arrive here, you may be asking, because I’m reading it and I’m wondering that too. Well, let us return to the night Valjean jumped into the garden. This is exactly where we left off on that wild tangent a couple sections ago, but it seems like it’s been a thousand years since Valjean scaled that wall. He and Fauchelevent are hanging out eating cheese and wine and Valjean is watching Cosette sleep. He has come to the conclusion that he must stay in this convent. 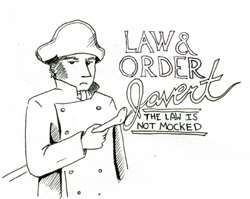 It is surely the most safest place to be, you know, besides a different city, or a different country, or any place other than the city in which Javert is currently employed. Be that as it may, Javert would never suspect him in this convent, since nobody gets in. That’s a pretty reasonable assumption, but there are a couple of problems with this amazing plan. A. Are the nuns really going to let another dude onto the premises? B. If they do, they can’t know that he’s already broken into their convent. I’m pretty sure that would quickly get him on their bad side and they’d never allow him back in. 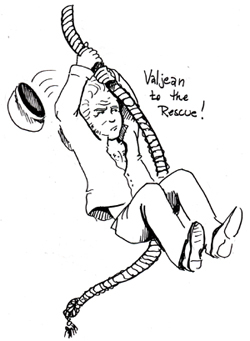 Valjean enlists Fauchelevent to help him scheme a way to accomplish his continued safety at Petit Picpus. Fauchelevent is rightfully dubious that he can do anything about it. He only has contact with Mother Innocent, and all the other nuns run away from his knee-bell. He suggests Valjean just climb over the wall the way he came in, but apparently that cannot be done in the opposite direction. No. Really? Surely, it would be easier for Fauchelevent to say…acquire a ladder than what’s about to go down? I guess that would too be simple and easy, and we can’t have that. Well, it just so happens there was a dying nun on the premises and Fauchelevent hears his own personal bell tone that means he’s being summoned to a meeting with Mother Innocent. Once he’s there, she goes into some long speech about the final wishes of the dead, particularly some of the sainted brothers and sisters that have lived their lives in service to God. Surely they deserve to have their final wishes honoured? She goes on to cite a couple of examples as precedent. Meanwhile, Fauchelevent is explaining that he’s old and decrepit and he could use a little help around the garden. He has just the guy! His “brother” and his “brother’s” daughter should come to live among them and help out. It seems as if Mother Innocent is down with this on one condition. Can Fauchelevent procure a lever to lift the stone covering vault underneath the altar in the chapel? Fauchelevent can. He wonders why she would want to do that though. She wonders if he did not hear the bells earlier that announced one of the nun’s deaths. He says he did not. He can’t hear much in his own little corner of the convent, besides, his bell is the only tone he pays attention to anyway. 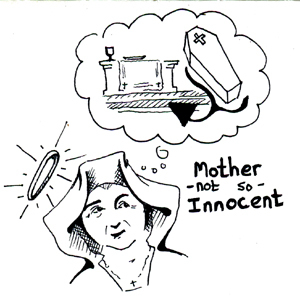 Well, Mother Innocent explains, this particular nun’s final wish was to be laid to rest beneath the altar in the coffin that she has slept in during her life. Wait. Is something lost in translation here again? Do nuns sleep in coffins for real? or was this woman secretly a vampire? Fauchelevent is taken aback, because burying people under the floor is just not done. There are safety issues! What of the health inspectors? They would never let them just stick a body underneath the altar in the church where alive people congregate. Mother Innocent is not going to let some silly government or the threat of disease get in the way of fulfilling this woman’s final wishes though. As far as she’s concerned, she’s got a higher authority that she must obey, so what does Fauchelevent think of those apples? Fauchelevent isn’t going to argue about it any further. So, now to get down to the gritty details… It’s easy enough to conclude they are going to have bury a coffin at the cemetery, so nobody catches on; but how is Fauchelevent going to sneak the empty box out of the convent without the pallbearers knowing it’s empty? Why is everybody leaving their scheming plans up to Fauchelevent here? He totally did not sign up for this when he fell under that cart. Good thing Fauchelevents are smarter than they appear. You see, before he fell on hard times and had to turn to being a cart driver, he was a notary. He wasn’t always a simple laborer. He easily concludes that they can just fill the coffin up with dirt and be done with it. Mother Innocent approves. With the plan in place, she dismisses him to go about his work. Back in Fauchelevent’s shed of collusion, Valjean is still chillin’, watching Cosette and eating cheese. He asks how the meeting went. Everything is set with to bring in Fauchelevent’s “Brother”, now to get Valjean out. It’s easy enough to sneak Cosette out, she’s tiny and easy to carry and hide. 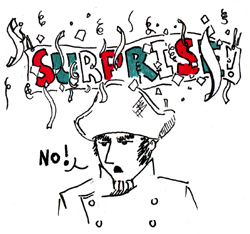 Valjean threatens her with Thénardiers again to make extra sure she doesn’t utter a peep, which is a tactic I don’t entirely like, but hey…it’s super effective. And what of Valjean? Fachelevent can’t just throw a blanket over him and carry him out under his arm. I would hate to bear the wrath of these nuns should they find an unauthorized dude on the premises. He’s just pondering this and how dirt in the coffin isn’t going to feel exactly like a human person … You know where this is heading now, right? You can practically see the lightbulbs appearing over their heads. And this is why you should read the “brick”. For every endless chapter about nuns or Waterloo, there are treasure chests full of gleaming gems of amazingness like this. I wish the sheer length of this novel wasn’t such a deterrent, because it’s so worth the read. It’s just a thousand more pages to love. Seriously, Valjean just sneaked into a convent, so he could sneak out of a convent. IN A COFFIN. So, he can legitimately enter the convent and hide out there; an opportunity that presents itself just because he ran into a guy he used to know, and a nun happened to die that morning and wished to be buried on the premises rather than in an outside cemetery. You also won’t know that Valjean is secretly hilarious. I don’t know that he means to be, but he is to my wry funny bone. Fauchelevent recoiled, and began to crack his finger joints. All plans are in place now. The only thing that Valjean is worried about in this surely foolproof caper is what’s going to happen when they get to the cemetery? Fauchelevent has that covered though. He knows the ins and outs of the place and is a personal friend of the gravedigger, who is also a drunk and easily distracted in his drunkeness. Fauchelevent plans to wait until the priest is done giving his blessings and then make sure the gravedigger is plastered then just send him home. 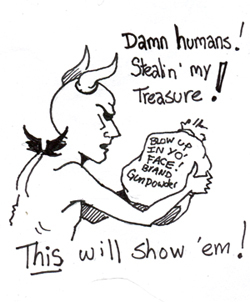 There is one important thing to note about the gravedigger’s duties. This cemetery has a gatekeeper and the only way the gravedigger can come and go after hours is with his card, which he drops into a box and is permitted entry or exit in some sort of 19th century key card system. If the gravedigger forgets his card than the gatekeeper can let him through by sight, but that’s a fifteen Franc fine. 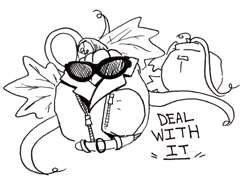 This is relevant information this time, I assure you. So the day comes and everything is just going swimmingly. Cosette has been sneaked out and is hanging out with a flower shop lady for the time being. Poor little Cosette is worried about this of course. I don’t blame her for having abandonment issues at this point. She knows something is afoot though and instinctively keeps her mouth shut about it. Meanwhile, let us return to: The Great Convent Escape! Everything has gone perfectly so far on all of Fauchelevent’s flawless schemes. There’s a nun under the altar, Cosette is away, and Valjean is squeezed into a coffin, ready to go. Nothing could go wrong, I tell you! NOTHING! I know we’ve been hit with the foreshadowing stick before in this book, but this is a particularly gratuitous beatdown. As soon as Fauchelevent meets up with the gravedigger everything starts falling quickly apart. This gravedigger is not Fauchelevent’s drunken friend. This is some other guy who is all business and no drinking. What happened to the drunk? Well, he up and died. How dare he! Fauchelevent is having a meltdown over here in the meanwhile, and is desperately trying to convince this gravedigger that he really needs to come out and have a drink. He even goes so far as to offer to pay himself, which is definitely above and beyond the call of duty. New guy sort of relents, but only after his job has been done will he go grab a cup of wine. Fauchelevent tries to convince him that the taverns will close soon, but this guy is really determined to bury this ‘nun’. Meanwhile, Valjean is chilling in the coffin, waiting for the priest to be done giving a blessing and for Fauchelevent to pry him out of this predicament. That’s when he hears the first shovel full of dirt rain down on him. 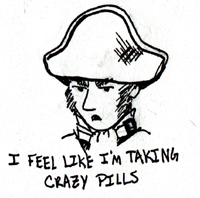 This causes Valjean to basically have a panic attack, and he just passes the hell right out. Back above ground Fauchelevent is beside himself. He doesn’t know what to do until he spots the gravedigger’s key card, and he gets an idea. He picks the gravedigger’s pocket and then asks him if he has his card. The Gravedigger can’t find it, and it’s almost time for the graveyard to close. He must go home and find his missing card or have to pay fifteen francs. This dude is really very extremely opposed to having to pay a fine, so he rushes off home. The gravedigger won’t be finding that card anytime soon, since Fauchelevent stole it and everything so there’s plenty of time to get Valjean. Fauchelevent is totally my hero right now. He is not just some rando that fell under a cart once upon a time. Okay? Soon enough, Valjean has been untombed and…well, he’s still passed the hell out, and Fauchelevent assumes he suffocated in there. He has another meltdown, but soon Valjean wakes up, the night air having revived him. 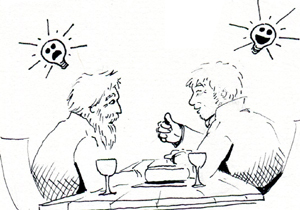 Fauchelevent admonishes him for nearly scaring him to death. All is right in the world again. They escape the cemetery using the stolen card and Fauchelevent stops by the gravedigger’s house (where he has turned everything over in the search for the missing card) to let him know the key is at the gatehouse. Fauchelevent “found” it on the “ground” and finished up the gravedigger’s job for him. The poor gravedigger is relieved and forever grateful to Fauchelevent. As is everybody apparently. The nuns are grateful that he’s helped them out with their scheme. They’re so pleased that they even give a report when the archbishop comes for a visit. Everybody is apparently A-Okay with storing bodies under the altar, government be damned! And Valjean and Cosette come to live with him in the Convent free and clear. Valjean’s new alias is Ultimus Fauchelevent, which is Fauchelevent’s actual brother’s name, but who is dead now and can’t use it. It is also a totally bitchin’ name. ULTIMUS! The nuns just call him “Other Fauvent” though. He gets his own knee bell so they can avoid him forever. As for Cosette, she goes to live in the school for girls where it is impressed upon her how incredibly homely she is. Which is mean, because she’s Fantine’s girl, there’s no way that’s actually true unless she inherited all of Tholomyès features or something. Which she hasn’t. It’s just something the nuns tell girls, so they don’t get ideas that they’re good looking enough to score a guy or worry about superficial things like appearances. She gets an hour a day to spend with Valjean and that is the best hour of the day for both of them. Though, Cosette does wish she would have brought Catherine along had she known she was going to be stuck in a nunnery for the rest of her life. This convent is Valjean’s new life. He dares not leave the convent for fear of being caught again, so that leads him to contemplation about his life in prison and this life here in which there are similarities. In fact, the nuns seem to live in even harsher conditions of their own volition than the convicts did. And this is how Valjean now spends his days, putting his mad hedge pruning skillz to use and contemplating stuff, like how Godly institutions and/or love seem to enter his life every time he feels like he’s falling back into the abyss to remind him to stay on the straight and narrow. He prays every night outside while the nuns are praying inside. 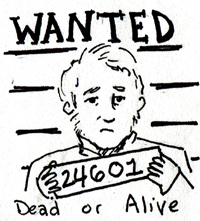 And as for Javert, he’s spent a month keeping his eyes peeled. Only a month? I guess so, because that’s the last we hear about this particular pursuit, but we all know it’s not the last we’ll be hearing of Javert. Tagged All the Nuns, Buried Alive, capers, Catherine, Cosette, Escape!, Fauchelevent, Good Guys Gardening, Inspector Javert, Jean Valjean, Mother Innocent, Petit-Picpus, Ultimus!